Step 1: First, the dentist will administer local anesthesia to numb the tooth and may place a dental dam in your mouth to keep the tooth clean and dry during the procedure. Step 2: Next, using a very small drill, he or she will make a small hole in the top of the tooth in order to access inside of it. The dentist will then use a small file to clear away the damaged or infected pulp and shape the inner chamber of the tooth and root. Step 3: Once the inner chamber is thoroughly cleaned and dried, the dentist will fill it with a biocompatible material and close the opening in your tooth with a temporary filling. Step 4: Lastly, a few weeks after the procedure the dentist will place a permanent crown or another type of restoration on the top of the tooth, returning it to its full form and function. Do you know what is more uncomfortable than a root canal? ­Needing one! 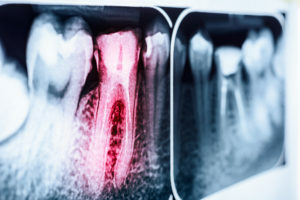 Although many people associate root canals with severe pain, most patients feel little to no pain at all during root canal treatment, according to the American Association of Endodontists. Thanks to modern anesthesia, root canal therapy is no more uncomfortable than getting a routine filling! Remember: living with an infected tooth is much more painful than fixing one! If you are suffering from severe tooth pain, talk to a dentist in Columbia today about the best way to find relief. An active member of the Missouri Dental Association, Dr. Philip Batson is passionate about helping central Missouri residents achieve and maintain healthy smiles. The Columbia native offers a range of restorative dentistry treatments for patients in need of dental rejuvenation, including root canal therapy. For more information on ways to save a damaged or decaying tooth, visit the Columbia Healthy Smiles website or call the office at 573-875-7071.